Kylie Delaney is one busy sophomore. In between training for national air rifle competitions and working toward her dream of becoming a large animal veterinarian, she immerses herself into a full course load of classes—all taken online. Kylie's balancing act is supported by River Online Learning (ROL), a Battle Ground Public Schools program that allows her to focus on biology, geometry, and English classes no matter where her competition and training schedule takes her. River Online Learning enables students in grades 6-12 to take classes online instead of in a traditional classroom setting. Students in the program can learn at their own pace from anywhere that has an internet connection. 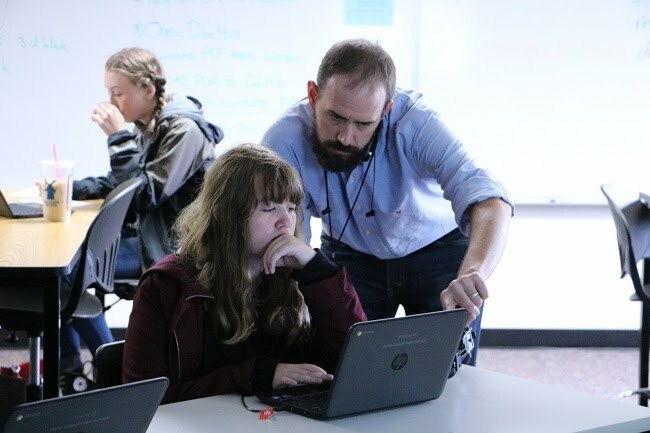 And when they need support, they can get it from certificated teachers and their peers at River HomeLink, Battle Ground's alternative learning school that provides a brick and mortar base for the online program. Continuous enrollment allows students to start any time and begin with just one class, and increase their course load over time to fit their specific needs. 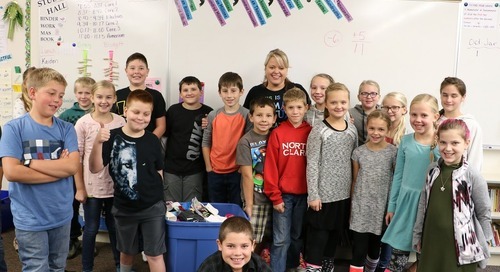 "River Online Learning works to fit the student, not make the student work to fit the program," said Darlene Wilgus, River HomeLink's assistant principal. "Help is always available to students whether it’s in person or online." With small group spaces, ROL teachers can help students who may need individualized assistance or who might otherwise get lost in a traditional classroom setting. 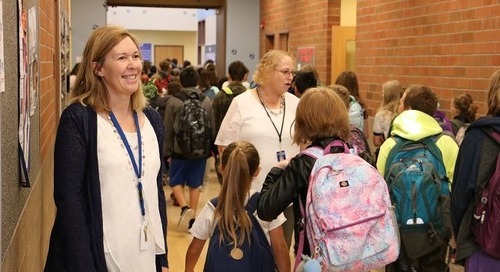 Full-time students in the program meet with teachers face-to-face on a weekly basis, while part-time students meet with teachers at least once per month to track progress and address questions or issues that arise. Students, parents, and teachers can also initiate additional or more frequent in-person meetings based on individual needs. In addition to providing this flexibility, River Online Learning also provides classes that are not offered at other schools, such as computer science courses, foreign languages such as Mandarin Chinese and Latin, and many more. Sophomore Peter Vorobets is taking courses to help him prepare to become an electrician. Freshman Hunter Gomulkiewicz is able to choose technology classes that fit his goal of becoming a video game designer. In all, there are 460 classes that ROL students can choose from, opening up a whole new world of learning opportunities. Students can also select from multiple course platforms that support a variety of learning styles. Classes are offered in multiple digital formats that allow for reading and video teaching as well as transcripts in different languages to accommodate students’ individual learning needs. ROL currently serves 76 full-time students within Battle Ground Public Schools, double the number enrolled last year. The goal is to further develop the program for students in grades 6-8. Additionally, online courses are available for a fee beyond the school day for students needing an additional credit to graduate on time. Students and parents interested in River Online Learning can fill out an inquiry form on the River HomeLink website at http://riv.battlegroundps.org. More information is also available by calling (360) 334-8261 or by emailing riveronlinelearning@battlegroundps.org.